Growth traders and investors are primarily focused on stocks with aggressive earnings growth or revenue growth (or at least the potential for aggressive growth), which should propel their stock price higher in the future. You'll often find smaller-cap stocks in this category because these are typically newer companies that are in the early part of their growth cycle. But you'll also find mid-caps and large-caps in the category as well. Growth stocks can carry a higher degree of volatility. But they are also known for producing spectacular returns. Value investors and traders favor good stocks at great prices. This does not mean they have to be cheap in price however. The key is the belief that they are undervalued. That they are, for some reason, trading under what their true value or potential really is. And the value investor hopes to get in before the market 'discovers' this and moves higher. A value investor will typically have a longer time horizon of 6-12 months or more. Value stocks are also typically associated with being less volatile. Momentum traders and investors look to take advantage of upward trends or downward trends in a stock's price or earnings. We've all heard the old adage, "the trend is your friend." And who doesn't like riding a trend? Momentum traders believe that these stocks will continue to head in the same direction because of the momentum that is already behind them. In fact, studies have shown that stocks making new highs have a tendency of making even higher highs. Momentum stocks, like growth stocks, can also carry a higher degree of volatility. Although the momentum trader expects the gains made because of this, to make it all worthwhile. Investors looking for both growth and income are generally looking for companies with stable earnings growth that pay a solid dividend. Oftentimes, these companies are more mature, larger-cap companies that no longer have the kinds of spectacular growth rates like some of the younger or smaller companies, or like they themselves had when they were younger and earlier in their growth cycle. Many of these companies are generating huge amounts of cash, but because of their size, may not have the growth opportunities they once had. Income investing is typically considered to be a more conservative style of trade, if done right. And the income investor will typically look to hold onto his or her stocks for a longer period of time. Introducing the new Zacks Style Scores, a complementary set of indicators designed to help you pick the best Zacks Rank stocks according to key trading styles with the best chances of beating the market over the next 30 days. We're excited to introduce the new Zacks Style Scores - a set of complementary indicators to help you select the Zacks Rank stocks with the best chances of beating the market over the next 30 days. As you know, the Zacks Rank is one of the most successful stock rating systems out there, with the Zacks Rank #1 Strong Buys producing an unmatched, +25.08% average annual return since 1988. That's more than double the S&P 500. Picking the best Zacks Rank Stocks just got easier and more profitable with the Zacks Style Scores. But, on any given day, there are over 200 stocks with a Zacks Rank #1 Strong Buy. Plus another 600 stocks with a Zacks Rank #2 Buy. All in all, that's over 800 top-rated stocks to choose from. It's a spectacular list of potential outperformers. But, a list so large that it can pose a challenge when trying to decide which ones are exactly right for you. Now, with the Zacks Style Scores, picking the best Zacks Rank stocks just got easier and much more profitable. 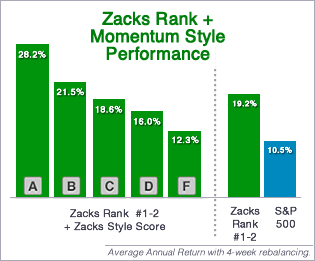 The Zacks Style Scores are based on academic research which has proven that stocks with the best value, growth, and momentum characteristics outperform the market. That is why we have assigned individual style scores of A, B, C, D, or F to each stock. We also produce the VGM Score ('V' for Value, 'G' for Growth and 'M' for Momentum), which combines the weighted average of the individual Style Scores into one score. This is perfectly suited for those who want their stocks to have the best scores across the board. As you likely remember from your school days, an A is better than a B; a B is better than a C; and so on. That means the better the score, the better the expected performance. And since the Zacks Rank helps predict which stocks will outperform over the next 1-3 months, the Zacks Style Scores were optimized to excel over this same time frame. These returns are on full display in the 10 year performance statistics we share below. 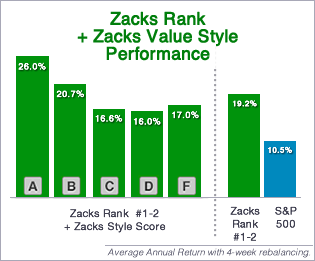 The key to success is to focus your portfolio on Zacks Rank #1 and #2 rated stocks which have your preferred individual Style Score, or VGM Score of A or B. Traders seeking value stocks are interested in companies that are undervalued. This deviation from their fair value is what creates exceptional upside opportunity. Of course, some stocks are cheap for a reason. Or, they may appear undervalued on one metric, but not on another. The Value Style Score separates the wheat from the chaff by using multiple criteria to truly find the most attractive value stocks. These value stocks have a long history of showing superior returns. Additional timeliness and greater outperformance is achieved when blended with top Zacks Rank stocks. There's much more to picking growth stocks than simply looking for those with the highest growth rates. Quality is important too. The Growth Style Score analyzes the growth prospects for a company, and also evaluates its corporate financial statements. The financial health and strength of a company can be determined by measuring aspects of the Income Statement, Statement of Cash Flows, and the Balance Sheet. Studies have shown that stocks exhibiting the best growth characteristics consistently outperform the market. And combined with the top Zacks Rank stocks, the returns are even better. Momentum traders look to take advantage of trends in a stock's price, believing that these stocks will continue heading in the same direction leading to timely and profitable trades. The Momentum Style Score indicates when the timing is favorable to enter a stock to take advantage of the momentum with the highest probability of success. The momentum-effect is quite strong among Zacks Rank #1 and #2 stocks because as earnings estimate revisions rise, prices race to keep up and anticipate future estimate revisions, resulting in even bigger gains. Not every trader fits perfectly into one style. Some have parts of each style in them. But, even if you do more closely align with one style over the others, finding a stock with the best scores on all of the styles can further increase your odds of success and rate of return even more. The VGM Score rates each stock on their combined weighted styles, helping to identify those with the most attractive value, best growth, and most promising momentum, across the board. Stocks with a VGM Score of A or B and a Zacks Rank of #1 or #2, have even better returns, on average, than the individual components, as it considers three times as many items that are correlated to future stocks returns. 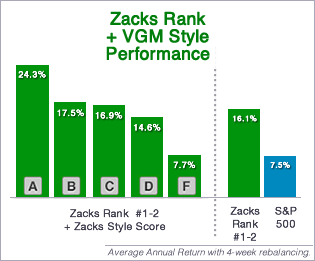 The combination of all three Styles that go into the VGM Score make it one of the most comprehensive and best performing indicators to use with the Zacks Rank. For nearly three decades traders have gladly used the Zacks Rank to beat the market. 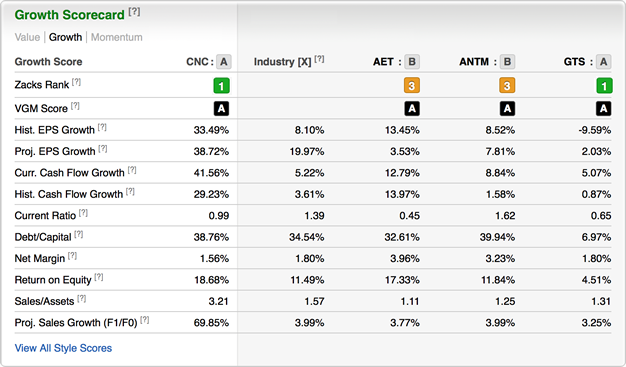 However, as you can see above, not all top Zacks Rank stocks are created equal. Some are better than others. And that is exactly why we created the Zacks Style Scores. To maximize your returns, you want to buy stocks with the highest probability of success. So that means buying stocks with a Zacks Rank #1 or #2, which also has a Style Score of an A or a B. There are times when it's perfectly alright to hang onto stocks with a Zacks Rank #3 Hold. But when you do, the same grade hierarchy applies; A's are better than B's, etc. But under no circumstance should you buy a stock with a Zacks Rank #4 or #5, even if it has a Style Score of an A or B. Remember, the Style Scores were created as a complement to the Zacks Rank. Regardless of how a stock might score based on its valuation metrics or growth attributes, etc., a poor Zacks Rank still means the company's earnings estimate revisions are going down, which means a much greater likelihood that the stock will go down too. Earnings estimate revisions remain the most important factor impacting stock prices which makes the Zacks Rank the very first step in any stock selection process. Then adding a favorable Style Score to the top Zacks Ranked stocks enhances your odds of success even more. But that also means selling a Zacks Rank #1 or #2, if the Style Score you used to select that stock in the first place slips to a D or an F. As the performance results show, a weak Style Score robs the stock of much of its upside potential over the next 30 days. It's better to sell that stock and switch into a new one with an A or B. Any stock in your portfolio that doesn't fit these sell rules can continue to be held in your portfolio with confidence. But obviously the more stocks you hold with a Zacks Rank #1 or #2 and a style Score of A or B the better. We wanted to make sure this information was prominently displayed for your convenience. That is why you will find the Zacks Rank and Scorecard ratings featured at the top of all Zacks.com quote and research pages. As you can see, it quickly summarizes the attractiveness of any stock. 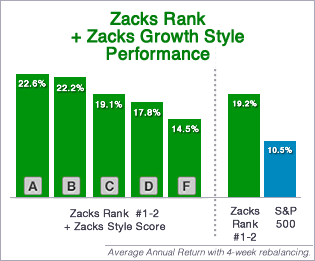 Again, only consider buying a stock if the Zacks Rank is a #1 or #2 and the Style Score that matters to you is A or B. That is exactly what the Zacks Style Scores page was designed for. From any stock quote or research page, just click the Style Scores link in the left hand navigation. Once there you will find a detailed table, specific to each Style; Value, Growth, Momentum, and VGM. Beyond your stock's Style Score, you will find the ratings for its three closest peers. Plus, we have added 10 items of importance that are vital to that trading style, and how the stock stacks up to its industry and competitors. Remember, the Zacks Rank remains the first step to your stock selection success, while the Style Scores are the next and final step to lock in your biggest winners. We hope you enjoy the new Zacks Style Scores. And we look forward to hearing about your great success using it in the days, weeks, and months to come.